Asobo Studio is coming off their development work on ReCore to shift gears into the horror genre with their upcoming game A Plague Tale: Innocence. We managed to nab a behind-closed-doors demo session with publisher Focus Home Interactive for this rat-infested game, and have our preview ready for you. Hope you’re not squeamish with rats! A Plague Tale takes place in France in the year 1349, at the height of the Black Death. You play as Amicia, who is 14 years old, as she tries to survive a harrowing existence with her brother, eight-year-old Hugo. They are the only family that either have left. The Inquisition is also taking place, so the danger is two-fold for the duo. Since they are children, their method of progression is generally a mixture of stealth and strategic hitting of objects with rocks via a sling that Amicia carries. We were shown a level that was built specifically for E3. It showed us a small portion of the game’s stealth options, where Amicia and Hugo snuck around, avoiding Inquisition soldiers in one moment, and then running away from rats the next. A major gameplay element shown here involved taking out sources of distant lights, so that rats could overpower and consume enemies, their blood-curdling screams fading to nothing as they are quickly eaten alive. It is an unimaginable, and horrible, way to go. Asosbo Studio has dedicated a good portion of development towards getting the rats to behave both realistically and in frightening manners. The general rule of the game seems to be that any source of light can keep people safe from the rats, which are ravenously hungry for any organic matter. Yet as we saw on the title screen of the demo shown, each rat remains an individual – you can track each as it moves about the group, pauses every now and then to sniff around, and then disappears back into the mischief, which is what a group of rats is called. Funny, yet fitting. While the demo we saw was running on a PC, the game is targeting release on the PlayStation 4 and Xbox One as well. While a game engine wasn’t specified, even at an early stage in development, it was running smoothly and had a distinctive art style. Since the game takes place during medieval times, expect to see a dark color scheme, dirty streets, stone buildings, and everything else from that era. 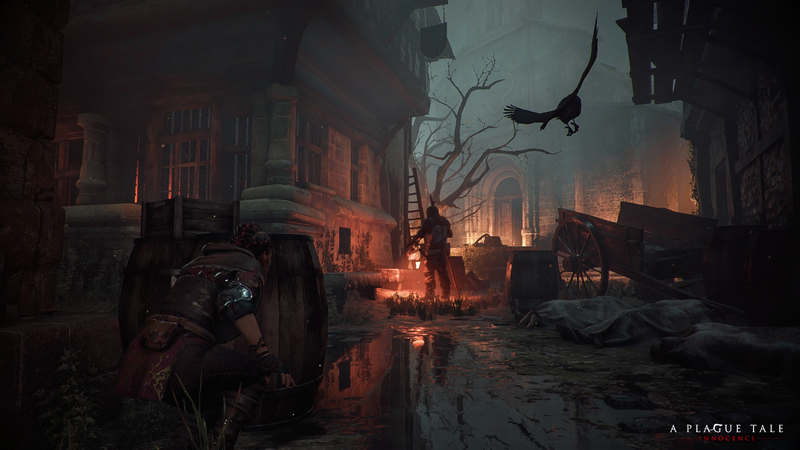 A Plague Tale seems to have tapped into a primal fear many people have of rats. Yet even the developer admitted to the fact that they were still trying to figure out how best to incorporate the rats into gameplay. So far, we’ve only seen rats react in a binary fashion – either you have light and are safe from them, or you have no light and are at risk of begin eaten by them. It’s still an interesting concept, to be sure, and we’ll keep the coverage coming as the game progresses towards a release date (currently to be announced).